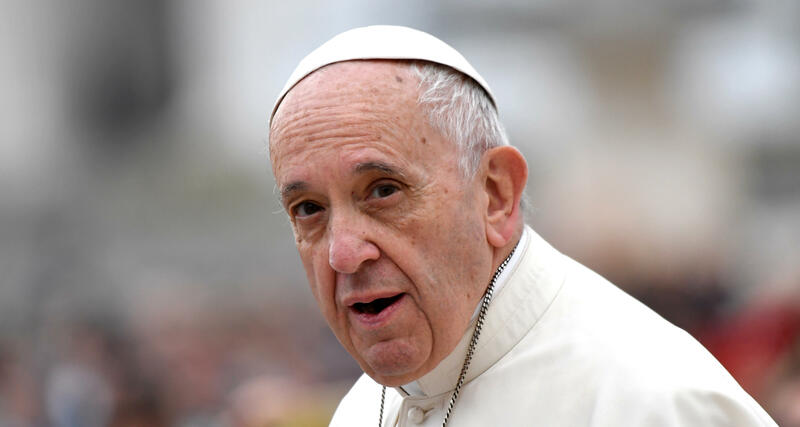 BONN, Germany -- Pope Francis denounced those who deny global warming and urged negotiators at climate talks in Germany to avoid falling prey to such "perverse attitudes" and instead accelerate efforts to curb greenhouse gas emissions. Francis issued a message Thursday to the Bonn meeting, which is working to implement the 2015 Paris accord aimed at capping global emissions. In the message, Francis called climate change "one of the most worrisome phenomena that humanity is facing," and urged negotiators to ignore special interests and political or economic pressures and instead engage in an honest dialogue about the future of the planet. He denounced that such efforts are often frustrated by those who deny climate change, are indifferent to it, or think it can only be solved by technical solutions. Also Thursday, the top American representative at the talks told other delegates the United States is still committed to reducing greenhouse gas even though the Trump administration still plans to pull out of the Paris accord. Britain and Canada, meanwhile, announced a new alliance aimed at encouraging countries to phase out the use of coal to curb climate change. Among others, the Global Alliance to Power Past Coal also includes Finland, France, Italy, Mexico, New Zealand and several U.S. states and Canadian provinces. In closing remarks to the conference, the U.S. State Department's Judith Garber said "we remain open to the possibility of rejoining (the Paris climate deal) at a later date under terms more favorable to the American people." Despite U.S. skepticism over the Paris accord, "the United States will continue to be a leader in clean energy and innovation, and we understand the need for transforming energy systems," said Garber, the acting assistant secretary of state for oceans and international environmental and scientific affairs. "We remain collectively committed to mitigating greenhouse gas emissions through, among other things, increased innovation on sustainable energy and energy efficiency, and working towards low greenhouse gas emissions energy systems," she said. The talks are expected to end Friday. While coal-fueled power stations are considered one of the biggest sources of carbon dioxide that's heating up the Earth's atmosphere, countries such as Indonesia, Vietnam and the United States are planning to expand their use of coal in the coming years. Even Germany and Poland, hosts of climate talks this year and next, are holding onto coal for the foreseeable future. Garber did not mention the use of coal, but said as countries strive to reduce greenhouse gas emissions, each "will need to determine the appropriate energy mix based on its particular circumstances, taking into account the need for energy security, promotion of economic growth and environmental protection." "In that context, we want to support the cleanest, most efficient power generation, regardless of source," she added. In a private initiative announced Thursday, Storebrand, a Norwegian investment fund that manages assets worth over $80 billion, said it would pull investments from 10 companies over their involvement in the coal sector. Chief executive, Jan Erik Saugestad, said the decision is meant as a warning to utility companies to "clean up" their energy sources "or lose customers and investors." The companies affected include German energy company RWE, Poland's PGE and Eskom Holdings of South Africa. Storebrand said it hopes the much larger Norwegian Sovereign Wealth fund, which holds $1 trillion generated from the country's sale of oil, will follow its divestment decision.